The Mystic Shipyard first opened its doors in 1843. At that time, the main focus was the construction of schooners and iron-clad ships. Then, around the turn of the last century, the shipyard refocused and became a place to build pleasure yachts. 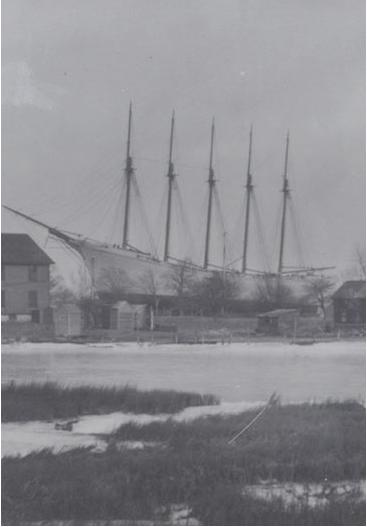 However, the Shipyard was known for the assembly of the five-masted, 249 foot coastal schooner, Jennie R. Dubois – the largest sailing ship ever built in Mystic; she was built in 1902. She cost almost $100,000 and was designed to carry 3,000 tons of coal or 2,000,000 board feet of lumber. Unfortunately, she had a problematic 20-foot draft. The Jennie R. Dubois worked on the River and the Sound for about two years, running aground frequently, before she was unintentionally rammed and sunk by a German steamship off Block Island. The schooner is immortalized in a painting, by S.F.M. Badger, that hangs in the Mystic Seaport Museum. In the early 1940’s, the Mystic Shipyard built catamaran power boats called sea sleds for racing and recreation and also as tenders for presidential yachts. In later years, the site was again re-purposed, this time as a recreational marina. Today, Mystic Shipyard is home to 155 summer residents and over 300 winter storage customers. Mystic Shipyard offers full services of custom shipwright carpentry, fiberglass repair and refinishing, rigging services, engine repair and re-powering and much more.